WINTER HAVEN, Fla., March 23, 2018 /PRNewswire/ -- Brick fans, start your engines! The newest attraction at LEGOLAND® Florida Resort combines roller coaster thrills with virtual reality (VR) technology to put guests in the center of an action-packed road rally where the laws of physics and aerodynamics only loosely apply. Now open at the multi-day vacation destination, The Great LEGO® Race invites guests into a virtual world where they're the star of a rollicking race against several LEGO minifigure competitors – all while taking an exciting roller coaster ride. During The Great LEGO Race, riders wear optional virtual reality headsets to experience the point of view of a LEGO minifigure race car driver in a wild and wacky competition against a pirate, wizard, surfer, pharaoh and trendsetter. 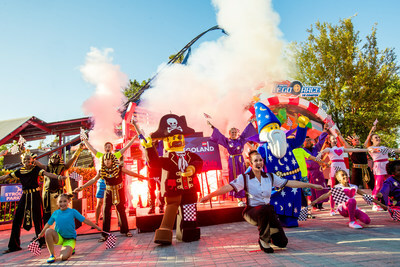 A spectacular grand opening ceremony celebrated the debut of The Great LEGO Race at LEGOLAND Florida Resort on March 23 in Winter Haven, Fla. The innovative attraction is the world's first virtual reality roller coaster experience built for kids. The wild and wacky race pits guests against a LEGO pirate, wizard, surfer, trendsetter and pharaoh driving brick-built vehicles like a rocket-powered windsurfing rig, a stylish scooter fueled by espresso and an ornately canopied bed (called a "litter") carried by mummy servants. The adventure begins as guests step through the ride's bold new entry portal, which features giant versions of several minifigure racers and their custom LEGO vehicles. The nearby queue is filled with colorful graphics representing each of the five racing teams, with themed elements to entertain waiting riders and video screens demonstrating the virtual reality experience. Once guests are dispatched aboard the ride vehicles, sophisticated technology syncs the virtual visuals with the roller coaster's twists, turns, drops and climbs, creating an all-new experience filled with action, surprises and humor — an experience only LEGOLAND could create. 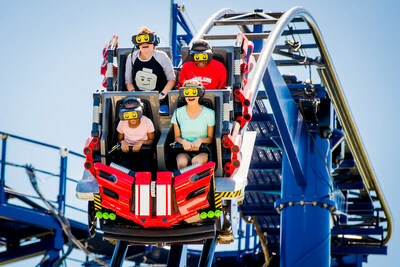 Developed under the supervision of Merlin Magic Making, the company's global creative and delivery division, The Great LEGO Race is the first virtual reality roller coaster experience designed for kids and represents the first time the LEGO brand and minifigure characters have been integrated with the state-of-the-art technology in a theme park attraction. For more information, visit www.LEGOLAND.com/race. LEGOLAND Florida Resort features more than 50 rides, shows and attractions inspired by popular LEGO and DUPLO® brands, including awesome experiences based on "The LEGO Movie™," "LEGO NINJAGO®: Masters of Spinjitzu," LEGO NEXO KNIGHTS™, LEGO City, LEGO Technic and LEGO Friends, plus LEGOLAND Water Park and on-site accommodations at the 152-room LEGOLAND Hotel and the 166-room LEGOLAND Beach Retreat. Throughout the year, guests can enjoy an incredible lineup of special events included with all forms of theme park admission. This year features LEGO® Star Wars™ Days (May 5, 6, 12, 13, 19, 20), Brick or Treat (select dates in October), KIDZ BOP Weekend (Nov. 10-12), Christmas Bricktacular (select dates in December) and Kids' New Year's Party (select dates in late December).